There’s a big difference between the types of entry- and mid-level fish finders found on the boats of weekend anglers and those that you could see on a professional angler using. While those in the former category are often very helpful tools, which will help you catch more fish and better understand the world beneath the surface, a true professional-caliber fish finder will transform your fishing entirely. The Humminbird SOLIX 12 CHIRP MEGA SI GPS is a great example of just such a fish finder, and it has all of the features and capabilities professional anglers demand. Equipped with a touch-screen interface, a 12.1-inch color display and an array of sonar technologies, this fish finder will help you locate fish much more effectively than lower-quality units possibly can. Note that there are two different models in the SOLIX product line: The SOLIX 12 CHIRP MEGA SI GPS, which we will focus on, and the SOLIX 12 CHIRP GPS, which is a more affordable product, that lacks MEGA Imaging capabilities. Because the SOLIX 12 CHIRP MEGA SI GPS has just about every feature you’d want and received great reviews by most anglers who’ve tried it, Fishing Tech rates this individual product and the entire SOLIX 12 Series as solid A’s. Most good fish finders in the $2,000-and-up category feature down- and side-imaging scanning sonar capabilities, but only Humminbird fish finders give you access to MEGA Down- and Side-Imaging technology. By emitting sonar pulses at frequencies that are 3 times higher than most comparable transducers, MEGA Down- and Side-Imaging technologies provide far more detail than most other fish finders can. Some anglers prefer touch screens, but others prefer traditional keyboards. Fortunately, the SOLIX 12 Series keeps both kinds of anglers happy, by incorporating Cross Touch technology in both models in the product line. Cross Touch functionality means that you can use either the touch-screen interface or the traditional keypad situated to the right of the screen to navigate, scroll and adjust parameters. 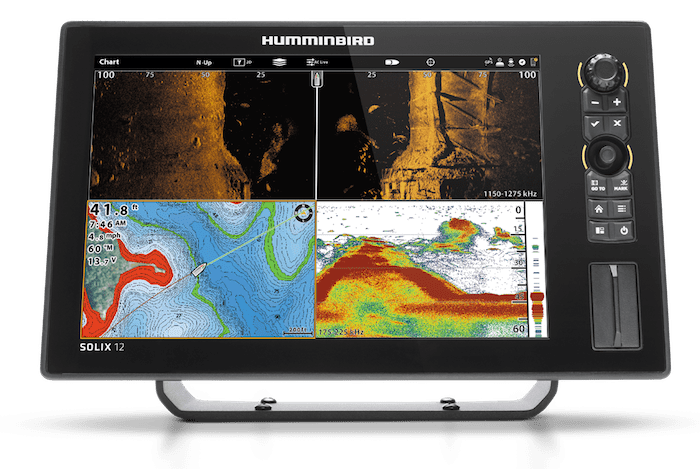 One of the most intriguing features of the Humminbird SOLIX 12 series is the AutoChart Live function, which gives anglers the ability to add data to existing maps, or create their own custom maps on the fly. By using this function, you can create maps that detail not only the depths and bottom contours, but vegetation and bottom hardness changes too. Unlike some other Humminbird product lines, which include several slightly different models, the SOLIX 12 Series comes in only two different option packages. Although the two products only differ in one key way (the presence or absence of MEGA Down- and MEGA Side-Imaging), this feature has a significant effect on the unit’s price. Frankly, we have a hard time believing that many anglers would be willing to hand over nearly well into the $2000's for the SOLIX 12 CHIRP GPS, without being willing to cough up an additional few hundred dollars to get access to MEGA Down- and Side-Imaging. However, if you do not feel like MEGA Imaging is crucial for your fishing success (or you already have a Humminbird Fish Finder with MEGA Imaging capabilities), you may find the SOLIX 12 CHIRP GPS the perfect sonar unit for you. The Humminbird SOLIX 12 is a feature-packed fish finder that includes a variety of basic and high-end features to help you find and catch more fish. A few of the most notable features and capabilities of the unit are detailed below. The SOLIX 12 CHIRP MEGA SI GPS is capable of exploring much deeper water than many of its competitors, thanks to its Xtreme Depth Sonar technology. While the unit is ready to explore depths of up to 1500 feet right out of the box, you can probe even deeper – down to 5,000 feet – if you add the optional 50kHz transducer. While no fish finder can guarantee that you will catch fish, you can at least be sure you’ll see them with the SOLIX 12 CHIRP MEGA SI GPS, thanks to its 360-degree sonar capabilities. Now, you can spot fish and structure up to 150 feet away in any direction from your boat. If you want to use the data a fish finder provides, you must be able to access the information in a way that makes sense for your circumstances. The SOLIX 12 CHIRP MEGA SI GPS allows you to do exactly this, thanks to its impressive array of screen customization options. You can display a variety of different screens simultaneously, and with the tap of the screen, you can instantly change any of them to a full-screen view. The Humminbird SOLIX 12 CHIRP MEGA SI GPS comes with a high-definition radar unit, which will help you navigate the waters in which you are fishing. This solid-state unit will enable you to navigate confidently in even rain, fog or low-light conditions. Both models in the Humminbird SOLIX 12 Series are Bluetooth compatible, which will allow you to see messages and calls to your phone right on the screen. You can even use the optional blue tooth remote (not included) to control your SOLIX fish finder from anywhere on the boat. Includes maps and charts for major bodies of water and features AutoChart Live, which allows you to create custom maps of any waters you fish. Several anglers complained about using threaded connectors for the SOLIX 12, rather than quick-release plug featured in some other Humminbird products. Whenever you are trying to decide on the best fish finder for your needs, you’ll want to compare and contrast the one you have your eye on with a few comparable models. This includes models made by the same manufacturer as well as a few made by others. Aside from the Humminbird 12 CHIRP GPS, which lacks the MEGA Down- and Side-Imaging functionality of the SOLIX 12 CHIRP MEGA SI GPS, the two most comparable units made by Humminbird are the ONIX 8 SI Combo and the SOLIX 15 CHIRP MEGA SI GPS. While the ONIX 8 SI Combo is priced comparably to the SOLIX 12 CHIRP MEGA SI GPS, it can’t be expected to compete with the features and screen size the SOLIX 12 possesses. In fact, the SOLIX Series has largely rendered the ONIX Series obsolete. The biggest difference between the two models is the 4-inch difference in screen size (the ONIX 8 has an 8-inch screen) and the ONIX 8’s lack of MEGA Down- and Side-Imaging capabilities. By contrast, the SOLIX 15 CHIRP MEGA SI GPS is several hundred dollars more than the SOLIX 12 CHIRP MEGA SI GPS, but only features one key difference: A display screen that is 3 inches larger. The two units are otherwise identical, so anglers only have to decide how important a larger screen is when making a choice between the two units. When considering fish finders made by other manufacturers, the two best comparisons are the Garmin GPSMAP 7610xsv and the Lowrance HDS-12 Gen3. Both offer features and capabilities that are broadly similar to those of the Humminbird 12 CHIRP MEGA SI GPS, but the Garmin product is about $200 cheaper than the SOLIX fish finder, while the Lowrance model is about $550 less than the SOLIX. The Lowrance fish finder has a screen of similar quality and size as the screen of the SOLIX, while the Garmin only features a 10-inch screen. All three models have GPS modules, chart-plotting capabilities and touch-screen functionality. They also possess down- and side-imaging scanning sonar units, various networking capabilities and included radar modules. The biggest difference between the units (from a features perspective) is the MEGA Imaging capabilities of the SOLIX. MEGA Imaging provides some of the best detail available among any fish finder, so your buying decision will primarily come down to how much you value this technology. If MEGA Imaging is worth about $500 to you, the decision is pretty easy: You should go with the SOLIX. If you are ready to move up from entry- and mid-level fish finders and have access to nearly available technology, the Humminbird SOLIX 12 CHIRP MEGA SI GPS is a great choice. It will provide you with just as much data as just about any other fish finder on the market, and the only clearly superior unit is the SOLIX 15, which simply features a larger screen. Based on the combination of features and capabilities the SOLIX 12 provides, Fishing Tech rates both of the SOLIX variants as solid A's. They are perfect for anglers who have the budget to afford them and the experience to leverage all of the information they provide.